If you love Dogs, have a Dog or are thinking of getting a Puppy, you are in the right place! Kids Pet Club has lots of fun facts, photos, videos, tips and games for you. Young Ambassadors and I share information on various pets and how to look after them especially dogs of course, because I am a dog (a handsome pug to be specific and Pugs love kids). Dogs are very adorable and I am a Toy Breed but we are not toys, we are living animals and need a lot of love and care for 10+ years. Make sure you do your research so you can be the best Puppy Pal in the world for us. Dogs like me are part of the canine family like coyotes, dogs, foxes, jackals, and wolves. We are direct descendents of wolves. We are warm-blooded omnivores (that means we eat plants and animals). We are the oldest domesticated animal in the world. Old bones suggest we have been around for over 30,000 years, maybe even much more. 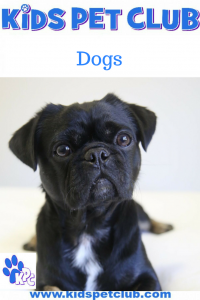 There are estimated to be over 400 million dogs in the world and over 200 types of pure bred dog plus lots of mixes (Pug rescues are my favorite of course). Dogs can hear and smell much much better than humans. Dogs are born blind. We start to see after about 10-14 days and we see a little differently to humans (we do not really see red and green). Dogs are often grouped into the following categories or types: Sporting, Hounds, Working, Terriers, Toys, Non-Sporting, Herding and Service. The very first animal to go into space was a dog, a Russian dog named Laika who travelled in the spacecraft Sputnik around the earth in 1957. 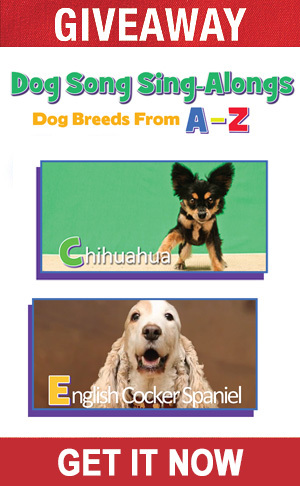 Find out more about The History of Dogs, Different Dog Breeds and How to Choose the Right Dog for You, and other Cool Facts about Dogs. Having a dog is a big commitment for 9-16 years. It takes time, work, love and money. Make sure you are ready and know how to take care of your dog and keep them happy and healthy. See our Dog Training Tips to help you bring out the best in your dog. It’s never too late to teach any dog a new trick. I LOVE doing tricks for treats. Try making cards, artwork, treat jars, cookies, bow ties and more. Sing-Along to classic nursery rhymes to funny raps. 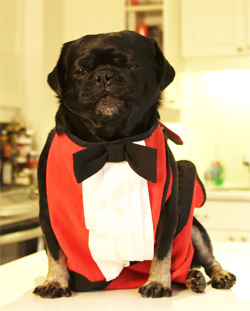 You can even learn to snort and count by two’s with me and Fishstick the Pug. Are you thinking about a puppy or bringing one home. Find out how to choose one that is right for you, and other things to consider. My Mom loves rescue dogs but if you do want to buy a puppy, make sure you do the research and get a good responsible breeder. Then make sure you do everything to help your puppy be safe, healthy and happy like puppy proofing, vert care, socializing and training.